Advanced AV has been working on improving videoconferencing between Main Line Health’s group of hospitals and health centers, incorporating Crestron’s RoomView for remote troubleshooting. PHILADELPHIA, PA—Advanced AV, with multiple locations throughout the mid-Atlantic region, has taken a holistic approach to meeting the needs of Main Line Health, a group of hospitals and health centers in a northwestern suburb of Philadelphia. The firm, which designs, builds, and installs major collaborative meeting environments around IT networking technologies, has initiated AV equipment standards across the medical group to streamline operation and maintenance and reduce requirements for in-house personnel. When the health group’s director of information services customer support, Steve Czapla, came on board five years ago, he soon discovered there was no reliable after-sales service from the existing vendor. After an initial trial project with Advanced AV, Czapla spoke with Bixler about putting service contracts in place across the group, and soon found that “their response times for service are amazing,” Czapla reported. Advanced AV has also been working on improving videoconferencing between sites, installing new infrastructure. “It’s important for them to have good, reliable systems in order to communicate and share content,” Bixler said. 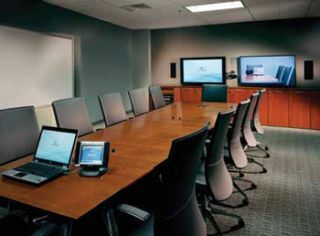 Upgrades include Polycom HD systems, complete with a Polycom bridge and the Converged Management Application (CMA). Here, too, Czapla has been pleased with the results: “CMA allows us to integrate the videoconferencing into our Outlook scheduling system, hopefully reducing the dependence on our field staff to be in the room to activate the videoconference unit. We’re also putting in Crestron’s RoomView. Folks at one hospital can remote in to a conference room at another hospital and turn things on or off or see if there’s a problem.” The RoomView server also integrates with Outlook for scheduling. Advanced AV is now in the process of integrating Sonic Foundry’s Mediasite into Main Line Health’s videoconferencing infrastructure. “We’ll be able to screen events live with the presenter on one side of the screen and a PowerPoint presentation on the other. And we can screen live to another conference room or to desktops,” Czapla said. Programs will also be recorded for later ondemand streaming over the group’s intranet. “We’re looking at that being a big boon for our medical education programs,” he said.